Marmite was first introduced to me as a mosquito repellent during an itchy, bug-filled summer. A British friend claimed that if eaten regularly, Marmite would somehow seep out of your pores as you perspired and cause all nearby mosquitoes to flee from the odor. It turned out that she didn’t even need to resort to hard-sell tactics like that; I fell in love with Marmite as soon as I had my first taste of the dark, sticky spread. Made from concentrated brewers’ yeast, Marmite (and its Australian counterpart, Vegemite) is a food paste usually spread on bread, but it’s also used to season dishes. Its distinct salty taste is enriched with a strong savory and meaty flavor that is reminiscent of beef marinated in soy sauce for much longer than necessary. However, those who dislike Marmite—and unfortunately, there are many—would compare Marmite to worse things. A friend who tried Marmite and ended up rinsing with mouthwash immediately afterwards thinks it smells like toe jam, and I can’t say he’s entirely wrong. Like many of my fellow enthusiasts, I may love Marmite, but I’m also quite realistic about it charms. Unless you’ve tried Marmite and decided which side of the divide you belong, you might not understand all the fuss, but our different reactions are nothing new to British people. Even in the United Kingdom, it is a divisive food, with Marmite’s own advertisements humorously acknowledging the number of people who loathe it. It’s such a symbol of extreme opinions that Tom Hardy used its divisiveness as a metaphor for his new show, Taboo. When the first Marmite factory opened in 1902, its founders would never have believed that Marmite would one day serve as a barometer of the fortunes of British society. The factory was built in Burton-Upon-Trent, Staffordshire, a town known for its beer breweries (it’s where Bass Brewery was founded), thus making it an ideal place to procure yeast. Fifty million jars are still produced annually there, and in 2010, a stone monument in the shape of a Marmite jar and informally dubbed the “Monumite” was unveiled in the town. Most people enjoy Marmite spread thinly over buttered toast and taken with a cup of hot, milky tea. The only way this blissful experience can be improved is by cutting up the Marmite toast into strips and dipping them into the runny yolk of soft-boiled eggs. But true Marmite lovers don’t limit themselves to the classic buttered toast. The multitude of ways Marmite can be eaten includes Marmite-banana sandwiches, Marmite French onion soup, Marmite popcorn, and my personal favorite, the fried Marmite chicken that you can find in neighborhood Chinese eateries in Malaysia. The chicken is first battered and fried until it’s crisp and then glazed with a sweet Marmite sauce. If you love Marmite, this is one of the most sublime ways to enjoy it, with its amazing combination of sensations: crunchy, juicy, sticky, tender, sweet, salty, umami. However, if Marmite repulses you, the smell wafting from the kitchen alone will likely make you ill. For those who’d like to try Marmite chicken at home, there’s an easy recipe here, though you might want to omit the Maggi Seasoning to lessen the saltiness of the sauce. Although it’s not as easy to find Marmite in the United States as in Commonwealth countries, it’s usually stocked by British food shops, Wegmans, and even Walmart—sometimes at triple the U.K. price. You might find better prices on Amazon, but unfortunately not for the limited-edition versions that have been released over the past few years. These include a blend made of 30 percent Guinness yeast, a fancy Valentine’s Day Marmite with champagne, one mixed with enough edible gold flakes to be served at a Trump breakfast (although the Trumps are clearly Marmite haters), and an “extra-old” version that has been matured for 28 days. 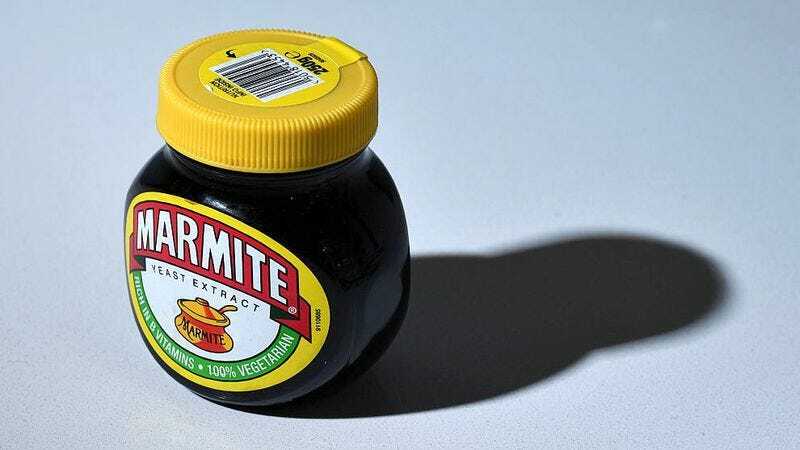 Some people might be lucky enough to persuade a Brit to smuggle a jar or two of limited-edition Marmite out, and it should be noted that Marmite is no stranger to illegal transportation. Thanks to its pungent aroma, it has often been used as a tool in drug-smuggling operations, smeared over packets of cannabis or used to hide meth. Along with its unfortunate involvement in drugs, Marmite has also managed to offend Denmark, not due to its taste but because of its vitamin additives, which led to a temporary ban in the country. Marmite has a high quantity of folic acid, thiamin, and niacin (vitamin B3), which means it’s occasionally featured in the media as a superfood, but maybe the Danes are right to be wary, as ingesting too much niacin can damage the liver. At the end of the day, though, it doesn’t matter how much you tout Marmite’s health benefits. It’s clear that people who don’t like it would rather swallow congealed french fry grease. However, most Marmite lovers are just fine with that; people who are happy to eat beer-brewing detritus are generally not a proselytizing bunch. But should you be brave enough to join the Marmite ranks, we’re happy to welcome you. Just as long as there isn’t a shortage leading to another Marmageddon.